WHAT CAN REATTACH DO FOR INDIVIDUALS WITH AUTISM? In the Netherlands we already provide the ReAttach for Autism intervention in institutions for Mental Health, private practises and institutions for people with cognitive disabilities. In WTA March 2015 a case study was published in Dutch. The method has been presented at the World Autism Organisation Conference in 2014 and 2016 and at the Autism Challenges and Solutions Conference in Moscow, April 2016. 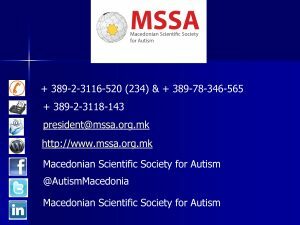 Prof Dr Vladimir Trajkovski has presented this autism research paper in Belgrade last year and represents us in the Balkan region. International training courses are scheduled to deliver the ReAttach for Autism in the upcoming year to: Belgium (Gent, Leuven, Antwerpen), Singapore, United Kingdom (London), Germany (Keulen, Mannheim, Muenster), Italy (Rome), Vancouver BC, Australia (Sydney, Melbourne,) and New York.